Congress has until July 1 to extend current low rates on subsidized student loans for more than 7 million undergraduates. WASHINGTON (CNNMoney) -- On July 1, the interest rates on student loans subsidized by Uncle Sam will double to 6.8%. The upshot? Students taking out loans for the next school year will have to dig deeper in their pockets to pay them off. Unless Congress steps in to stop the increase from going forward. The issue has become a political talking point. President Obama, who called for congressional action in his State of the Union speech in January, is using the issue to stump for votes. His Republican rival Mitt Romney says he, too, believes Congress should step in. On Tuesday, Senate leaders said they will take up a bill within days to extend the lowered interest rates. The Senate minority leader, Mitch McConnell, said Republicans are willing to consider the measure as long as there is a way to pay for the extension. What's at stake: More than 7 million undergraduates have subsidized student loans, which means the federal government absorbs some of the interest rate for lower- and middle-income families based on financial need. If Congress does nothing, the cost to students borrowing the maximum $23,000 in subsidized loans is an extra $5,000 over a 10-year repayment period. The cost to the federal government to extend the lower interest rate is $5.8 billion, according to an analysis by the nonpartisan Congressional Budget Office. And that's a big reason why House Republicans aren't inclined to go along with extending the rate. How it got to this point: Subsidized student loan interest rates used to be 6.8%. But when Democrats took over the House in 2007, they passed phased-in cheaper rates for subsidized student loans. 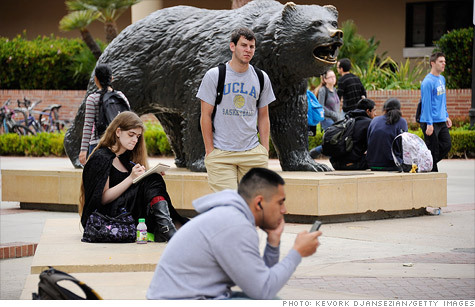 The rates fell to the current low of 3.4% for subsidized Stafford loans this past school year. The rates are scheduled to revert back to 6.8% for the 2012-2013 school year. And with unemployment just below 24% for teenagers and 14% for those ages 20 to 24, more young people are going back to school or staying in school, according to recent data by Equifax. Additionally, more students struggle to pay back those loans. Student loan delinquencies involving payments more than three months late rose 14.6% in 2011 from the year before, according to Equifax. While Obama has pushed to expand access to college for low- and middle-income children, lawmakers have taken several steps to whittle away at student aid. Congress eliminated subsidized loans for graduate students, as well as most discounts. They also cut $8 billion out of the Pell Grant program for low-income students and reduced the income threshold for eligibility for a full Pell Grant. What happens next: President Obama has made extending the cheaper student loan rate a campaign issue, and will continue to use his bully pulpit to urge lawmakers to prevent a doubling of interest rates on federally subsidized student loans. Bills in the Senate and House would extend current student loan interest rates for a year. But House Republicans aren't on board yet. They don't want the federal government to extend low rates without finding a "meaningful" way to pay for them. "The rising cost of tuition is a serious problem for students and their families, so it's unfortunate that Washington Democrats put in place a law that would double student loan rates," said Michael Steel, a spokesman for House Speaker John Boehner. "That's why Republicans and Democrats on both sides of Capitol Hill will be working on this issue in the coming months."